1. We Hoard Credit. It always blows my receding hairline back when I read the words of Philippians 2:3: “In humility, value others above yourselves.” Now that’s counter-cultural. Ready for the opposite? When a leader is engulfed by a desire for success, we are greedy with acclaim. It’s not enough that the community outreach drive went well; we need everyone to know it was our idea. We minimize the gifts of others, passing on initiatives and programs that don’t line up precisely with our wheelhouse. The organization starts to take on our personality and preferences. When things go well, we stand in the front of the line and shake hands. But when things go poorly, we stand armed with a list of reasons why it’s not our fault. As leaders, we sometimes forget the most important truth in life: that we were created to give God glory, not vice versa. 3. We View People as Commodities. Leaders on the hunt for success can warp into social climbers. We spend our time and energy pandering to the people who can lift us to the top with their money and influence. We are calculated in the relationships we have with those in the notable crowd, but we are careless toward the least of these. Sure, we are “nice enough,” but inadvertently, we establish an internal hierarchy that assigns value to the people we encounter at the bank, in our neighborhood, and at the grocery store. This selective strategy completely contradicts the upside-down Kingdom of God, which says that the greatest among us are not those who look to be served, but those who are willing to serve others. 4. We Chase Numbers. As a commercial real estate broker, I spend the majority of my weekdays looking at property prices, traffic patterns, and square footage. What leader can’t relate? There’s pressure to hit certain volumes, to grow the number of people coming in the door, and to make sure you have enough space to keep services and programs running efficiently. Numbers are important, but they should not drive our vision; it should be the other way around. When we launched our church seven years ago, we knew we wanted to be Outsider-focused. As a result, we committed to giving a minimum of 50% of tithes back into missions. The vision of being Outsider-focused drove the numbers (over 50% going back out the door). If we get too caught up in head counts and P&L spreadsheets, we tend to water down our vision to accommodate the statistics. 5. We Forget Our Calling. Success feels warm and fuzzy. Especially when it’s accompanied by a certain amount of money, success, and prestige. Sometimes when we pursue the calling that God has given our lives, we get distracted by the bright and shiny opportunities to our left and right. We see other people’s accomplishments and decide we are more capable or we deserve success more than they do. So we start to emulate their businesses or ministries, but the results don’t seem to add up. Not only can this lead to resentment, but it can also distract us from using the unique gifts that God has given each one of us. 6. We Rage. Almost every day as my family flies out the door to school and work, we pause for a minute to put on the Armor of God. Even my two-year-old knows the pieces by heart. But you know what? It doesn’t take long for me to face real-life situations that make me question whether Paul was serious about that whole “we wrestle not against flesh and blood” thing. Sure, most of us clench our steering wheel when someone cuts us off on the highway, but if we have our eyes fixed on success at all costs, we will experience disproportionate levels of frustration and rage. We fly off the handle when plans don’t go our way. We keep a record of even the slightest of offenses. We speak before we think. Our skin grows thinner and thinner. The worst part? Rage left unchecked will drive away even our most loyal supporters. 7. We Neglect Family. Sometimes you just need to go home and let the laptop battery die. Or ignore that “crisis” call during dinner time. You know, the one where you put your hand up and push away from the table (conveniently) just as the kids are starting to panic over the fact that you’re making them try brussel sprouts. When our time and energy get squeezed, the first ones to feel the pain are family. We find excuses to stay at work or grab coffee before heading home. We zone out when our spouse tells us about their day. We quickly forget what it feels like to get on the floor and play with our kids. If you take away anything from this post, let it be this: don’t make family a casualty in the quest for success. So, now that all the cards are on the table and we’re ready to take an honest look in the mirror, what do we do if we find ourselves serving success and not others? It’s not complicated. We should have a conversation with God, then our family and mentors. We confess the ways we have tried to steal the credit, abandoned our calling, neglected people, or led with a spirit of pride. And we can’t afford to stall. 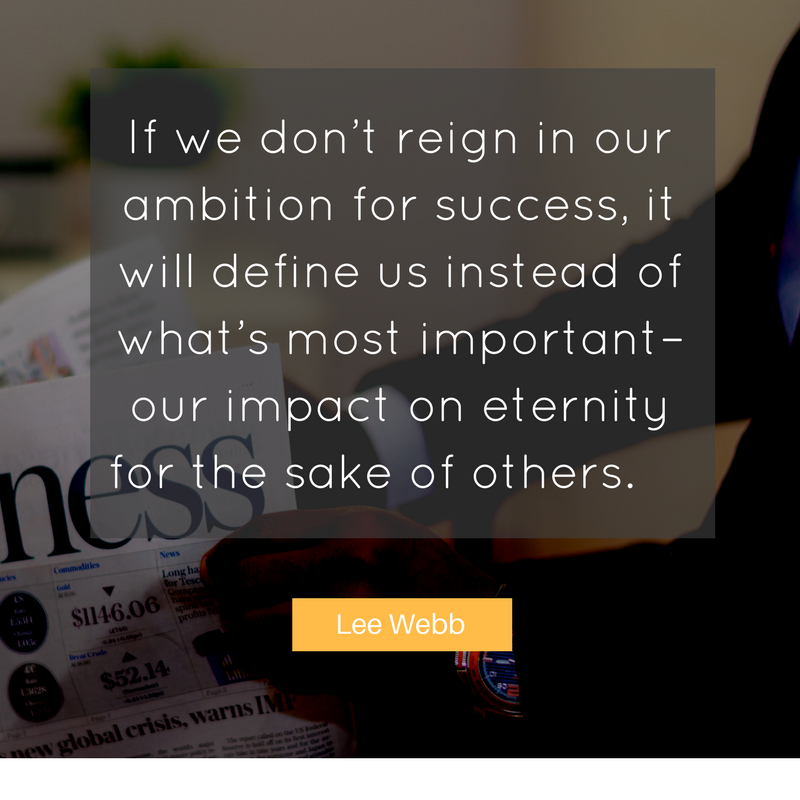 Because if we don’t reign in our ambition for success, it will define us instead of what’s most important–our impact on eternity for the sake of others. Well written, well said and some crucial things for me to reflect on daily. Thanks for sharing.